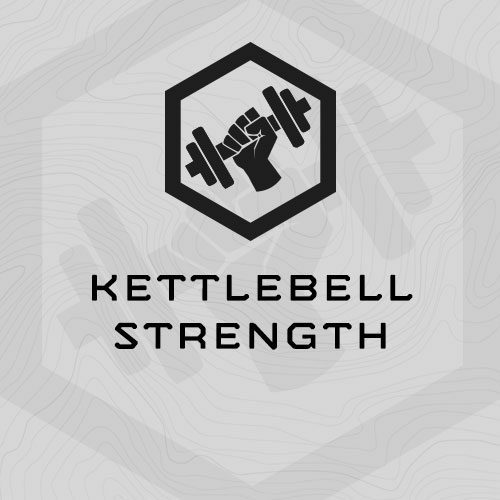 Strength Focused program for kettlebell enthusiasts using our classic strength progression. TLU stands for Total Body, Lower Body, and Upper Body. Within a TLU strength session, each component is trained (total, lower, upper) but with a differing intensity (loading) and volume (reps to per set and total reps per exercise). We’ve deployed TLU progression for years, and it continues to be our favorite for hybrid athletes like tactical and mountain athletes. In this plan, we apply our strength programming philosophy kettlebells and bodyweight. You’ll train five days/week for 4 weeks (20x total sessions), performing an assessment at the end of Week 1 and Week 4. The plan’s focus is Strength, but you’ll also train Work Capacity and Working Strength throughout the cycle. To complete the program, you’ll need to be familiar with higher level kettlebell exercises including 2-Handed Snatches and 2-Handed cleans. In cases of strong athletes, males may need 32 kg and females 24 kg. Each session should take 45-60 minutes. Unless indicated, the circuits aren’t “for time.” Work briskly, not frantically through the training sessions. Each session includes mobility and other durability drills. No additional stretching is necessary. How do reps count for unilateral and 1-direction exercises? The prescribed rep count is the count for one limb, so …..
What about Swings, Snatches, Cleans and other Kettle Exercises which can be either 1 or 2 hands? The program indicates if the exercise is 1 or 2-handed. For the purposes of this program, for Swings use 1x kettlebell, and for Front Squats, use 2 kettlebells. How do you find the prescribed rep count for Friday’s Assessment Progression? We use Fridays during this cycle to train “Working Strength. The first and last Friday of the program you’ll actually take an assessment. The second and third Friday you’ll complete density training based on your initial assessment numbers. Here’s an example. Part (1) of the Assessment is Max Reps in 1 Minute of Kettlebell Front Squats. Let’s say you scored 23x Front Squats in 60 seconds at 20kg. 35% of 23x reps = .35×23 = 8.05. Round to the nearest hole number = 8. So you’ll set a repeating timer for 90 seconds, and every time the timer goes off, for 5 rounds, you’ll do 8x Front Squats at 20kg. For the 6th Round, when the timer goes off, you’ll do as many front squats as possible in 60 seconds. You can rest – and even put the kettlebells down if needed, but keep going the full 60 seconds. Use the same methodology for the remaining assessment events. 3x is hard, but doable, then immediately …. (1) Max Reps in 1 Minute ….